She recounted her experience starting at Princeton University, in Princeton, New Jersey. She said she felt out of her depth as a first-generation college attendee until she reached out for support. The event brought out numerous celebrities, who wore T-shirts from their alma maters. They spoke about their college experiences and congratulated the students. Among the speakers were Academy Award-winning actor Robert De Niro, "black-ish" star Tracee Ellis Ross and "Mike & Molly" star Melissa McCarthy. Shaik Jaman, a 17-year-old who'll be in the first generation of his family to go to college when he attends Hunter College this fall, said he was inspired by Obama's words. 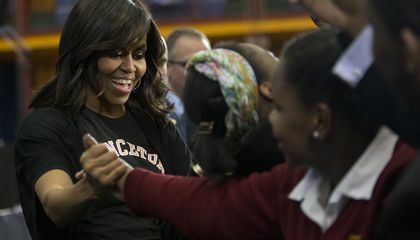 Many college students get into college and never finish with walking away with a degree, but Michelle Obama is telling students to keep working no matter what. People may not think that they can get through all of college because members of their family were not successful or they don't think they have enough of what it takes. Michelle Obama told the kids that she didn't have a lot of great examples in her family when she went to college and not everyone has to have a perfect childhood to accomplish the things that they want to do in life. I think that Obama showing up and trying to encourage the younger generations in education to shoot for the stars is amazing. Incoming college students need encouragement because they really don't know what to do on there first day and they will get lost and then they will need a little bit of help. If the children go to college for the first and do not know what to do then they will want to leave and not come back but if they have encouragement then they will stay a little bit longer and that is because they had encouragement to stay.As a freshmen in college it can be hard and they will not know what to do but in someone helps them out then that will be a little better because some one knows what they are going through. It will always take a little encouragement to make things better. Incoming college students need encouragement because they think that since they are done with high school, they are done with school all together. But they need to look at it as the beginning of school. Not the end. They need to take college just as seriously as all other schools even though college is not mandatory. It can also help determine their future. Just like high school does. Incoming college students need encouragement because they will be the next generation of Presidents, Cops, etc. The students need to get a better education and get great jobs to show the Obama's that they took their words serious. Some of the students that Mrs.Obama talked to said that they got inspired to continue on with their education and get a college degree. "Alexandra Lu, an 18-year-old senior at Brooklyn Technical High School, said she will be a freshman at Stony Brook University in the fall. She said she was thrilled to be cheered on by such famous faces. "They made it seem like it's really exciting, so I was really excited, too," she said.Shaik Jaman, a 17-year-old who'll be in the first generation of his family to go to college when he attends Hunter College this fall, said he was inspired by Obama's words. "It motivates me," said Jaman, who also goes to Brooklyn Tech. "Maybe I can be just as great as her or even better." Incoming college students need encouragement because, some kids don't even feel like going to college. Some people think that college is too boring and long. Others think that its just a waste of their time and that they don't learn anything. Others that are in college will eventually dropout do to this. Incoming college students need encouragement because lots of these people going into college aren't very excited. 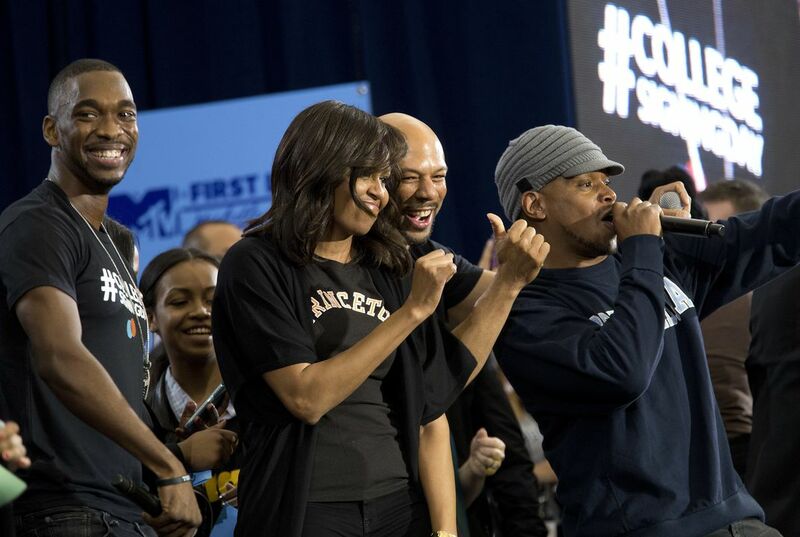 But when Michelle Obama told all these high school kids to make the best out of everything, some people changed their minds about their ideas of college. "She encouraged them to make the most of their college experiences, get involved in campus life and ask for help when they need it.". Most of the people going into college think only about the bad things, but they will achieve a lot, and have fun at the same time. Why incoming college students need encouragement is because when they go to school teachers want them to do their best. They also need encouragement because a lot of students don't want to try hard. In the article the First lady Michelle Obama said"My parents didn't have money. I went to public school. We didn't have a whole lot of examples to follow. But I know that if I can do it, you can do it, too." She was basically telling them to try their best and they can do it. Incoming college students need encouragement because it gets hard when you're in college. When things get hard, they may not do well, and think that they should just drop out. Some students may have not even planned to go at all. I think that encouragement will just make them want to go and do even more, and try to be successful.